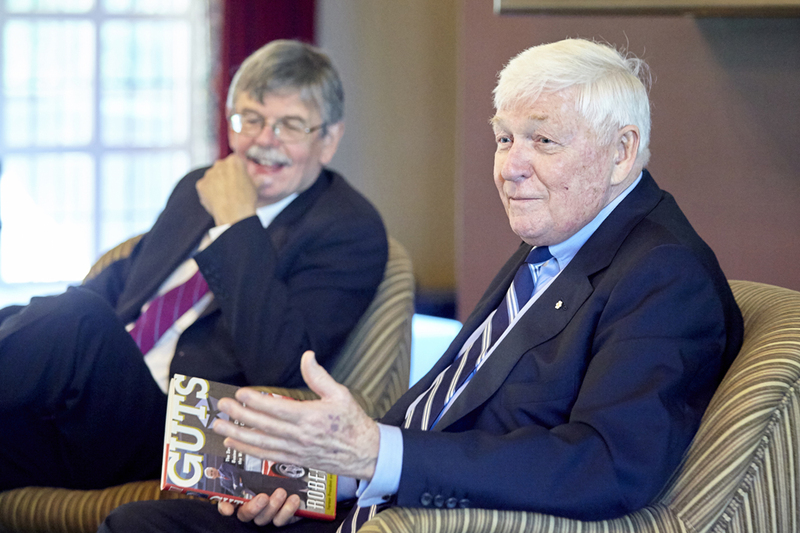 Lynton “Red” Wilson (right), McMaster’s former Chancellor, in conversation with Business Writer in Residence Gordon Pitts. Wilson is supporting two new courses at DeGroote known as Imagining and Navigating the Future. In our rapidly-changing world, business as usual is not an option. That’s why the DeGroote School of Business will be offering two new courses later this year that blend strategic foresight tools with leadership skills development. Imagining and Navigating the Future 3ZZ3 will be open to third and fourth-year students from any faculty, and qualifies as an elective in McMaster’s new Minor in Innovation. It will run throughout the Fall 2019 semester. Imagining and Navigating the Future B718 is intended for graduate students from any faculty. It will be offered during an intensive five-day module from Aug. 26-30. Building on strategic foresight methods used by the likes of 3M, Google, Microsoft, and the Institute for the Future, the courses will help students understand the forces shaping our current world. They will also enable students to envision future-oriented scenarios based on trends, signals, and imaginative projections, and develop the leadership skills needed to navigate rapid change. Topics will cover a wide range of issues, such as the changing world of work, technology disruption, the future of finance, the future of healthy living, and climate change resilience. The new offerings are supported by Lynton “Red” Wilson, BA ’62 & LLD ’95, McMaster’s Chancellor from 2007-2013. A distinguished retired public servant and business executive, Wilson was named an Officer of the Order of Canada in 1997 and was the lead donor behind the construction of the L.R. Wilson Hall, McMaster’s home for the liberal arts. “Looking ahead, the implications of rapid, disruptive change are fast becoming a significant challenge for contemporary management. It’s about coping with ‘where the puck is heading,’ to quote Wayne Gretzky’s father,” says Wilson. “I am very pleased to support the pilot of the Imagining and Navigating the Future courses at the DeGroote School of Business,” he continues. Tom Gleave, Industry Professor and Advisor to DeGroote Dean Len Waverman, is leading the initiative. “I am very excited to be part of this visionary and timely initiative. We know society is facing many challenges in the years ahead, including effectively responding to technology and business model disruptions, our changing demographics, and climate change,” Gleave says. “The strategic foresight and leadership models students will learn will enhance their creative problem-solving capabilities, and strengthen the kinds of analytical, collaboration, and communication skills employers value,” he adds. For further details on Imagining and Navigating the Future, please click here.